ZALORA – one of the fastest growing online fashion and beauty retailer in Southeast Asia had launched their own Android Shopping App. The Android app enables on-the-go shoppers to seamlessly navigate over 500 brands and 15,000 products across the apparel, shoes, accessories and beauty categories. Press release as follows. ZALORA, South-East Asia’s fastest-growing fashion and beauty e-tailer, today announced the further expansion of its mobile repertoire with the launch of its Android shopping app across the region (http://www.zalora.com.my/mobile-apps/). The app launch follows the successful launch of the ZALORA iPhone shopping app three months ago, which within 24 hours, became the #1 lifestyle app in the iTunes stores of all ZALORA countries, and the #1 overall app in Malaysia, Singapore, and Vietnam. In addition to these shopping features, the ZALORA Android app also provides a richer mobile shopping experience – It uses the built-in capabilities of the Android OS to create engaging native animations such as with the ‘add-to-cart’ action. The app also manages to cater to all ZALORA markets despite each e-store’s localized ZALORA product collections, by routing shoppers to the fashion and beauty catalog for their respective locations (see below for a view of Android App visuals). 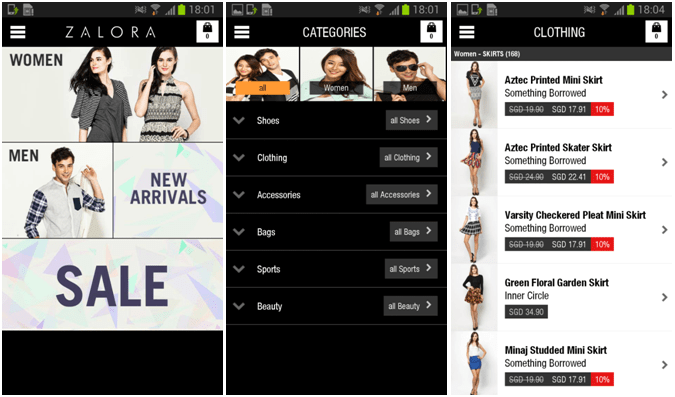 Further to this mobile development, ZALORA will also be launching a redesign of its mobile site in August. The redesign will feature a more visual navigation route, with a style focus that is optimized for marketing and customer relationship management (CRM). The new and improved site will also feature additional filters, a clear multi-step checkout, and social sharing (see below for a view of preliminary visuals).